Lisa is a young doctor from Ukraine. She started to work for STEP-IN in January 2017. It was a hard decision for her to come to Iraq. She had to quit her job, leave her home country, and head towards the unknown. Now there is no one in STEP-IN, that could imagine these 5 months of the project without our Lisa. 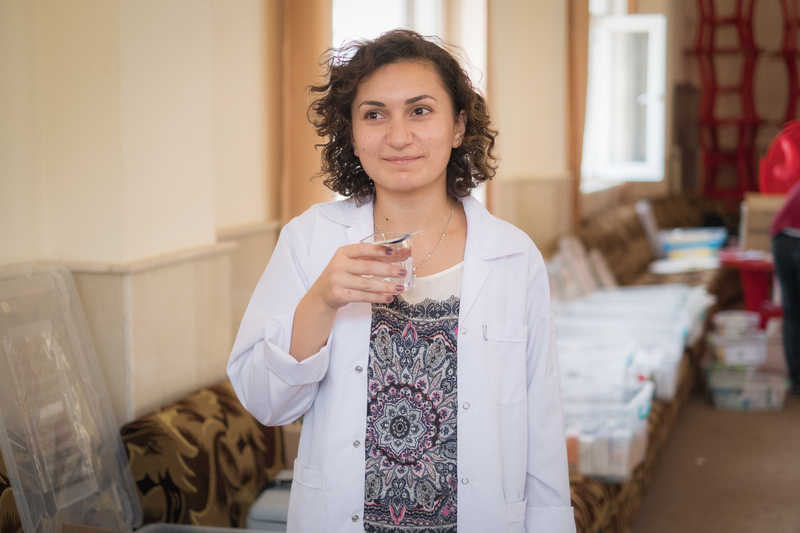 Lisa’s journey to Iraq started on a day, when she decided to study medicine. However, at that time, she had absolutely no idea that one day she will be a doctor in Iraq. Now she is known here by the local people as ‘Doctora Lisa Porkurishke’ [Kurdish for curly hair]. I [interviewer]: Why did you decide to study medicine? L [Lisa]: It was a spontaneous decision. I never wanted to be a doctor. At first I studied law but then I quit. And then, as I had a free year, I started to visit one health center near my church and learnt there how to do physiotherapy… Basically, I quit law and I had no idea what to do in the future. But then, one priest told me, that I could study medicine. At that time, I didn’t have any other idea, so I went. I prayed before all of my exams for medical school, because I had just one months to study everything. And then I got into the medical school. I: When did you decide to come to Iraq and what influenced your choice to join STEP-IN? L: A good friend of mine was already working for the project for half a year [this is our Doctora Katia] and she called me and said that they need doctors, I should join. Katia told me that here [in Iraqi Kurdistan], the people are really in need and they are suffering hard conditions. I had many doubts but I wanted to discover something new, or take some time to understand myself better. However, at that time, there was an ongoing conflict in Eastern Ukraine and I felt that there is a need to go and help there. At the same time, the project [in Iraq] was all the time on my mind and I felt like I really want to go. My logic was telling me that I should stay and work in a governmental hospital in Ukraine and that I shouldn’t be escaping from my responsibilities at home. In the end, I just prayed and received the answer that I should go to Iraq. So I went [smiling]. I: As you mentioned, you are a Christian, but in Iraq you have worked with people from different religions, like Muslims or Yazidis. What it was like? L: For me the most interesting part was the contact with Yezidis. I was very curious to understand their culture, to see how they are different and their different approach to life. In the end I grew to see them as people with the same problems and challenges as we have. And the same dignity. In addition to that, it happened to me several times, that some of my patients, or colleagues, which practice a different religion from mine, told me that they will pray for me. There is a very nice ecumenical connection. I: And from the medical side? L: Of course, in some topics it is more difficult. Sometimes, women patients are shy to talk about their gynecological problems because there is a man that is translating for me. We try to encourage our patients that their information won’t leave the room. But sometimes they sometimes they just won’t tell us. Than we try to call a woman translator, but she might not be always available. Also, when you work through a translator, you don’t have this personal contact with a patient. It somehow makes it more difficult. But our translators are amazing and they are doing a great work. I: What is the biggest difference in healthcare between Iraq and Ukraine? I: How do you mean that? L: Here everyone is prescribing antibiotics to everything. 70% of every treatment consists of prescription of antibiotics. Also, there is this huge difference, that here, doctors can take almost 100 patients until 4 o’clock in the afternoon and I cannot imagine that. For me it’s not possible. If I really want to help a patient and go deep into their medical history, I can do up to 20 patients. I: The western media is consumed with articles about the refugees coming to Europe and the conflict in the Middle East. I assume that you had some opinion about this topic before you came to Iraq. How do you see this issue now? L: Now I know the people personally. Before it was, I am sorry, but mostly statistics. Yes, I was interested in the topic. There was all of this discussion about whether to take refugees into Europe or no. I was always wondering, what is the truth about these people. But here, it’s all different. I see how much people are suffering. I know some of these people personally and I no longer take them only as a statistical number. You just become more involved, you start to understand their stories, you work with them every day and they share with you their troubles. I: Once you will come back to Europe, how will you look at those that are so often labeled as economic immigrants? L: For sure differently. Of course. If you would put a European to live in similar conditions in the camps, after they escaped their home without even a second set of clothes, you understand that it’s not economic reasons. They don’t want to live only wealthy. They just want to live in a safe place and don’t be afraid that someone will kidnap or even kill their family. Of course, we can’t say that this is the truth about all of them, and some of them might be economic immigrants, but we should be very very careful about what labels we put on these people. I: It must be hard to be working in a country that is so different from yours. What were the biggest challenges for you? L: The emotional part. A lot of patients tell you, that I am doing fine if I have my medications, but the truth is that there is a horrific experience behind their current medical state. For example, one women told me, that she cannot sleep because ISIS took her husband and she has no idea where he is right now. Also, we are only primary care and I cannot help them in a specialized way that they need… [thinking] There was this big shift in me, when I visited Qaraqosh [a Christian village east of Mosul]. We had a mass in this destroyed church by ISIS and even military was protecting us during the mass. Then I realized, that in Ukraine, I am free to go to church, I don’t have to think about whether it’s dangerous or not. Few weeks after, we started to work in Dawoodia camp. And there I understood that working in a humanitarian project is not about me, or about my experience in Iraq. I realized that God put me in Iraq, to be here for the people around me. My view changed from this egoistic perception to a feeling that I am not here for myself but I am here for the people. I: You will be leaving Iraq in a short while. What is your best memory from here? L: It’s a plenty of memories. But for sure, one of them would be the Kurdish dancing. I remember that one day after work, we just stopped with our car on the side of the road, we went out, and we started to dance this traditional Kurdish dance. [laughs] And the STEP-IN team itself. I: Has your time in Iraq changed your perception of the world? L: For sure it did. For me there was this point of Nepovernennja, as we call it in Ukraine. It is the point from which you cannot go back. It was the moment when we started to work in Dawoodia camp. We were a really small, small team, but still I could see that we were making a change. We still are. Maybe small but significant. And then I understood that if everyone helped in some way in a humanitarian project it could make a great difference for many people. Somehow we just don’t see the full picture of lives that people are living here. Yes, we see it in the news but it’s just not the same. And there are countries, where life might be even worse. You simply realize that life is not as you might see it. I: What are your future plans? L: To upgrade myself so when I will come back, I will be more productive. [laughs] Well, if I will come back. I am not sure yet. I would love to but you never know what are God’s plans. Lisa is leaving from Iraq next week. It was very hard to say goodbye to her. Especially for the local staff. They prepared a nice goodbye party for her, where they gave her presents that everyone chose together. As she said during the interview: “One cannot change everything, but even a small change is important.” I am certain that Lisa’s work with STEP-IN changed many lives and the entire team is grateful for her work here in Iraq.